The many holes in the bottom of these cups promote healthy roots with even drainage. Letting the roots grow their own way, right down through the pot and out of the sides, allow for bigger, healthier roots. Uses - These net cups work with many types of media -- hydroponics or soil-based. Expanded clay pebbles, lava rocks, pumice, vermiculite, rockwool, etc. Reusable - Easier to clean, uv-resistant. Our net cups will last from season to season. Durable - Wide Lip Design! You'll notice comfortably-sized lip along the top of these containers, making them easy to grab, lift and transport. If you've ever experienced hand cramp or fatigue, let our cups come to the rescue. 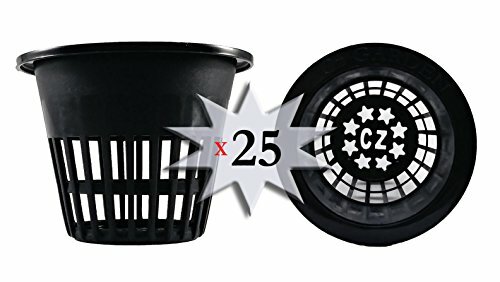 (Cz All Star Net Pots) - Check out our full collection of net cups, bucket baskets and other containers to round out your garden supplies. Numerous but narrow slits properly contain appropriate-sized grow media. Wide Lip design = more surface area to grab and transport plants or quickly lift & view the roots! 100% Money Back Guarantee if unsatisfied! Our Cz All Star Net Pots are the best on the market. They come with a 30 day no questions asked money back guarantee! Aquaphoric Self Watering Planter (7”) + Fiber Soil = Foolproof Indoor Home Garden. Modern Decorative Planter Pot for All House Plants, Flowers, Herbs, African Violets, Succulents. Easy / Looks Great.